Engineering Competitions and Clubs give high school students the opportunity to research and design a solution to a problem. The engineering competitions take place during the school year and are coordinated by a high school teacher. After school engineering clubs provide an informal setting for exploring engineering design and are coordinated either with a high school teacher, undergraduate student or graduate student. These activities can provide modules for formal or informal curriculum development. Timeline for these activities vary. 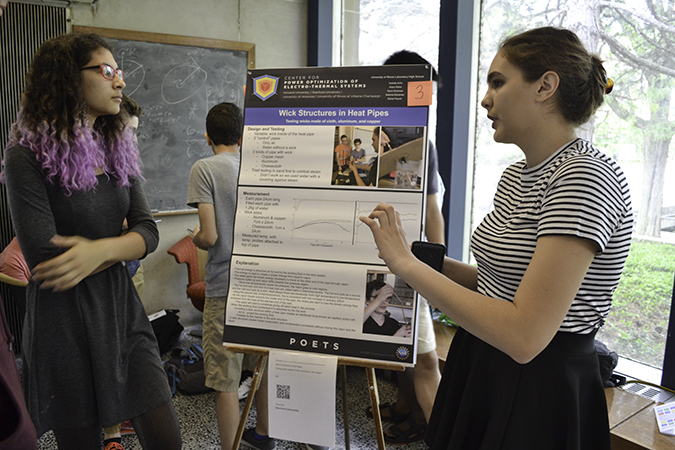 Two Uni High students present their research project about heat pipes as part of David Bergandine's POETS RET curriculum module development.